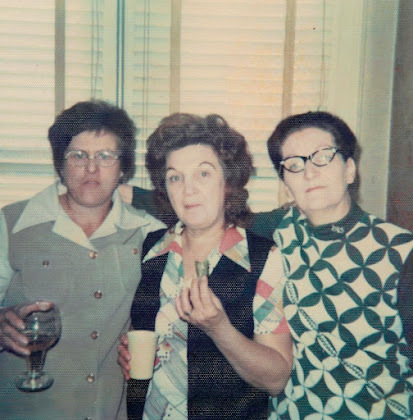 Vintage Photo Friday: The Ladies Who Lunch? Today on Vintage Photo Friday, we have a visual aid to some old school casual Fridays and working women who "do lunch." And back in the 60s, the ladies of the office took casual Fridays...perhaps a little too casually. Sure, they have their smart polyester dresses, their power suits, their vests. As a matter of fact, the only thing these ladies were casual about was the company's rule on sobriety during business hours. The woman on the left is going heavy on the champagne (per the ridiculous facial expression), that middle one is definitely hitting some rum and coke mixes and the woman on the right (leaning in drunken stupor) has her on eye on a line of shots next to the ol' rolodex. If these were the ladies who lunch from yesteryear, lunch was of the liquid variety. I think those ladies are doing their own brand of liquid diet! They aren't losing much weight but they don't care. I like their style, Helen. I do. To hell with the calorie counting. It's time for Casual Consumption Friday at the office!